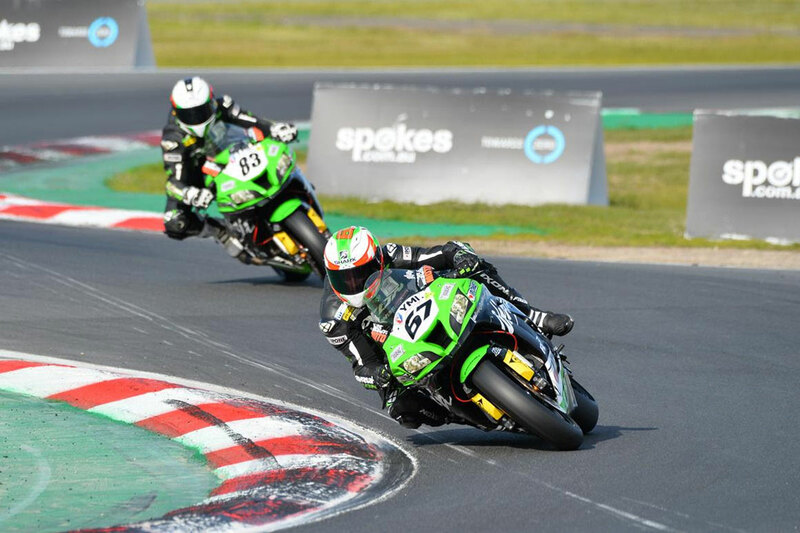 Winton’s sixth round of the 2018 Australian Superbike Championship (ASBK) in Victoria offered a mixed day for the Kawasaki BCperformance team, as Kyle Buckley lodged a stellar seventh overall placing while Bryan Staring managed a solid fourth in race two. Buckley showcased promising speed in qualifying with the 12th-fastest time of 1m21.811s, which he later made respectable improvements upon. Race one saw the Queenslander recover from the first restart to ultimately wind up in 10th. He surged to eighth in race two for seventh overall, marking one of his best performances this season. “It was a good day, although I wasn’t very happy with the first race,” said Buckley. “I got caught up in the turn one incident and had grass all over my tyres – the first few laps were pretty much useless to me and I lost a lot of time. I managed to get back to P10, but I really felt I could’ve gone a lot better. Western Australian Staring once again displayed signs of potential, setting the fifth fastest qualifying time of 1m20.753s. Unfortunately, the number 67 went down into the first turn of race one, resulting in a costly DNF for the former champion. Rebounding in race two and overcoming two restarts, Staring mustered up fourth position. “I’m pretty disappointed really,” Staring declared. “It was an underwhelming and unsatisfying Sunday for us and it wasn’t through a lack of trying. I felt I got shot out of the sky in the first one – I was a bit unlucky there and had no option but to put the bike on the ground. Following a stint of difficult rounds, BCperformance Junior Team’s Giuseppe Scarcella fought through for sixth overall in the Supersport category with 8-6 results. Team manager Kelvin Reilly sympathised with the squad’s challenging weekend, although he’s remaining optimistic for a strong finish at Phillip Island. “The end result in the second race was good, but I expected a bit more to be honest,” Reilly commented. “The red flags messed us up, but on race pace with a race tyre, we had the ability to win this weekend. Kyle did brilliantly today, he’s really stepped up and showed his true potential. GSR Kawasaki’s Glenn Scott wound up 11th overall in his third appearance in the ASBK championship, while it was a difficult weekend for Swann Insurance Kawasaki’s Matt Walters, who was eighth in race one before crashing out of the final race. Cube Racing and Kawasaki-mounted Supersport contender Tom Toparis charged to third overall and continues to maintain second in the standings, while teammate Oli Bayliss managed to finish second in the Supersport 300 category aboard his Ninja 300. The Australian Superbike Championship will now head to Phillip Island on 12-14 October for the seventh and final round of the series.. Visit www.asbk.com.au for further information on the series.